Calling all ricotta and chocolate lovers! Here is the perfect make ahead dessert to end any meal. This Italian Ricotta Chocolate Tart Recipe incorporates both dark & semi sweet chocolate, melted & combined with ricotta, rum & orange zest. It is then baked to perfection as a simple chocolate tart. Your taste buds will be in ricotta heaven! I think that it should come as no surprise that the overall look and smell of food will contribute to the taste factor. After all, hasn’t it been said that you eat with your eyes first? 🙂 I’ve worked as a dietitian in patient food services for decades, and I’ve also known a few professional chefs in my life, and the consensus definitely is: looks matter! The simple truth is that whether food is being served in a restaurant, in a hospital or in the comfort of your home, if whatever is in your plate does not look appetizing, chances are it will not have the same appeal as a well plated dish. Now, that being said, look at this mouth watering tart… and let me know if you can already anticipate the chocolaty silkiness! The personality matches the appearance in this case. Not too heavy, not too light, not too sweet, not too savoury, this ricotta pie hits every note just right. As you may have guessed, there are two parts to this recipe: the crust and the chocolate ricotta filling. Using the large holes of a cheese box grater, grate the butter directly over the flour which has been placed in a medium sized bowl. Combine together with your fingertips until you get a coarse uniform texture. Why grate the butter? Many years ago, I saw an episode where Chef Michael Smith talked about his preferred method of incorporating butter with flour to make his biscuits. I have since adopted his “grated butter” method and it always works like a charm… just take a look at these garlic scape cheese biscuits or these buttermilk biscuits to be convinced! Just looking at these biscuits will make your mouth water in anticipation of a fluffy southern biscuit! Ok… the next step is to transfer the flour-butter mixture on a wooden board and make a well. Once formed, add the egg yolks, sugar, vanilla extract, baking powder and a pinch of salt. Working quickly, combine until you get a ball of dough. Form into a disc, wrap in plastic wrap and refrigerate for about half an hour. In the meanwhile, we can start with the filling. What to make with egg whites? You will notice that this tart recipe will only make use of egg yolks. The egg whites can be used to make these soft amaretti cookies or perhaps an egg white omelette. If not using right away, they can also be frozen. Break both the dark and semi-sweet chocolate into little pieces and place in a heatproof bowl set over a pot of boiling water. Make sure the bottom of the bowl does not touch the water. When the chocolate is almost melted remove the pot from the heat and continue stirring until the chocolate has completely melted. Set aside to cool as we prepare the rest of the ricotta filling. In a large mixing bowl (of a stand mixer) beat the ricotta and orange zest on low speed with the paddle attachment until smooth (approx 30 seconds). Make sure to scrape down the sides of the bowl a few times. Gradually add the sugar, whipping cream, rum and finally the melted and cooled chocolate. Combine this whole mixture together. Set aside while we roll out the pastry dough. If you would like to make a lattice top for this tart, remove about one quarter of the dough. With or without the top, this chocolate tart will look and taste amazing! Cover the bottom of a greased and floured tart pan and spread the ricotta chocolate mixture. Roll out the rest of the dough to make the lattice top or leave as is. Bake in an oven that has been preheated to 375°F for about 40 minutes. Allow to cool completely on wire rack. This chocolate tart can be made up to 24-hours before serving. In fact, the orange and chocolate flavors become more pronounced. A simple dusting of sugar before serving and you are done! If you are familiar with my blog, you know that I absolutely love ricotta and use it often in desserts. The origins of this chocolate tart can be traced to a cookbook I purchased at a second hand book store over a decade ago. I have already made reference to this wonderful cookbook, The Italian Way, when I posted this recipe for Limoncello Ricotta Cake a few months ago. The original recipe included only semi sweet chocolate. I prefer to have a mixture of dark and semi sweet chocolate. I have also made this recipe using Toblerone and surprisingly enough I prefer the mixture of dark and semi sweet chocolate. This chocolate tart or if you prefer Crostata di Ricotta al Cioccolato would truly make a spectacular dessert to serve on Easter day or any other special event. Enjoy!!! Place the flour in a medium bowl. Grate the butter directly into the bowl. With your fingertips, and working quickly, incorporate the flour and butter together. Turn the mixture onto a wooden board and make a well. 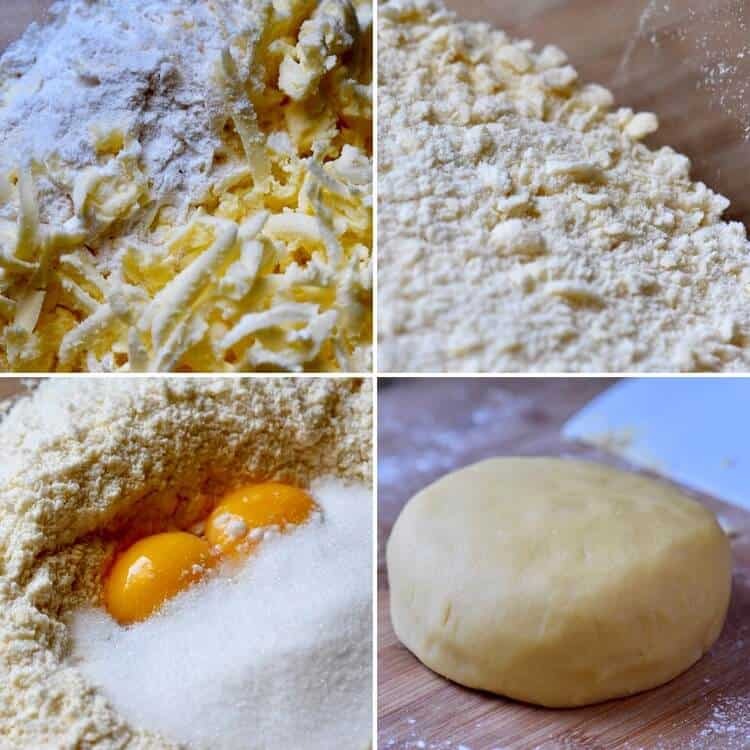 Add the rest of the ingredients for the crust and with your fingertips or a fork begin to pull in the flour. Meanwhile, break the dark chocolate into little pieces and place in a heatproof bowl. Bring a pot of water to a simmer. Set bowl of chocolate over pot of water. Ensure water does not touch the bottom of the bowl. When chocolate is almost completely melted, remove from heat and stir to finish melting. Preheat oven to 375 ° F.
Prepare 9-inch tart pan by buttering and flouring or simply use non-stick spray and set aside. Roll out the dough to fit your pie plate. Thickness should be between 1/8 - 1/4 of an inch. Carefully fold over and fit into your pie pan. Optional step: If planning to decorate with strips of dough, set aside about 1/4 of the dough. Place the filling into the tart pan. Optional: decorate with strips of dough. Bake for approximately 40 minutes or until the center filling is set. Refrigerate until serving and dust with icing sugar before serving. it says to add 1/2 cup of whipping cream to the filling. This might be a really stupid question but I assume this is heavy whipping cream, and if so, do I need to use a hand mixer to make it into “whipped cream” first? Like a cool whip? OH my goodness Maria, this has my name on it! Chocolate, orange and ricotta, yum! CWhat a stunning tart – and perfect for Easter. I will definitely be making this – and pinning it too. Oh definitely heaven! This cake looks absolutely amazing. Ricotta is one of the best ingredients for cake making. I would love a slice of this right now! Oh my oh my! Chocolate + ricotta baked into a tart = my kind of dessert. Yum! This tart looks yummy! Would make a great dessert for easter I’m sure! I am drooling… What a wonderful twist on a classic recipe for Easter or any other time of the year. I would love a slice with an espresso just about now. Thanks Paula… you are always welcomed ♥ Have a great week-end! That buttery crust is one thing, but that chocolate ricotta filling with orange and rum! Wow! Sounds delightful! Where is the ricotta in the recipe? Oops…thanks John 🙂 Recipe has been updated. Have a great weekend!